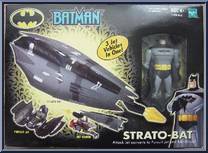 Batman All Terrain Vehicle with Projectile Launcher! with Capture Hook and Projectile Launcher Arm! 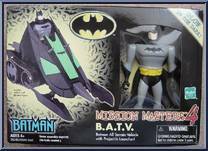 Attack Jet converts to Pursuit Jet and Bat-Glider! 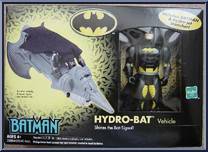 Batman's enemies have conspired to destroy Gotham City's vast electrical grid, releasing billions of voltage-devouring kinetobots into the city's po. . . 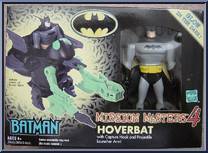 Criminals rule the Gotham City night… but not for long! 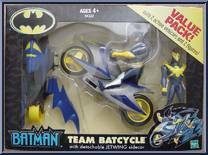 With sirens wailing and searchlights sweeping the streets, Batman and Nightwing ride out to drive evil form the city! 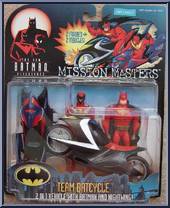 On Team Batcycle,. . .